Three Colorful Crater Lakes Of Kelimutu Volcano, Indonesia. Three crater lakes in the mouth of Kelimutu Volcano on Mount Flores in Indonesia have attracted many tourists’ attractions because of their different colors. Let’s look at the most fantastic scenes of these colorful crater lakes. 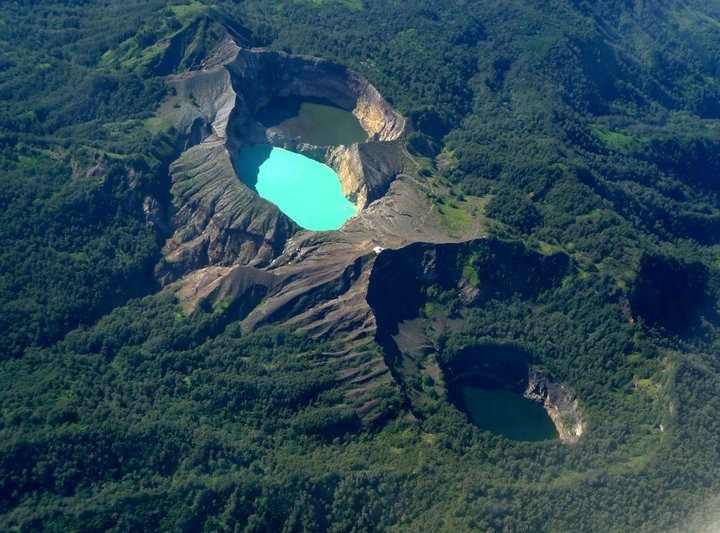 Located some 60 kilometers to the east of Ende, Flores, East Nusa Tenggara, are three lakes of three different colors that are collectively known as the Kelimutu Lakes. Tiwu Ata Mbupu is totally blue and is the westernmost of the three lakes while two others are separated by a narrow septum about 35 m high. Tiwu Ata Polo has a reddish hue and Tiwu Nuwa Muri Koo Fai is green. Before 2006, the lakes were red, blue and white. After that, the red lake is black-brown, the blue lake becomes light green and the white lake is black. Some locals have believed that a light green lake is a gathering place for the spirits of young men and women; the black-brown lake, for evil spirits and the black lake, which is located some 200 meters away, for the spirits of old people.